Within my AD structure, group management is delegated within certain OU’s, I now need to replicate that functionality in the FIM portal. The is no real way of identifying which groups should be managed by whom, except the OU within which the group currently resides. Setup an export flow for adOU into the portal. Then, by using the Lithnet PowerShell Module, we can create all the sets and MPR’s required, below is a sample for creating one delegated “collection”. In production, my XML file is much bigger – delegating group management to around ten different groups. 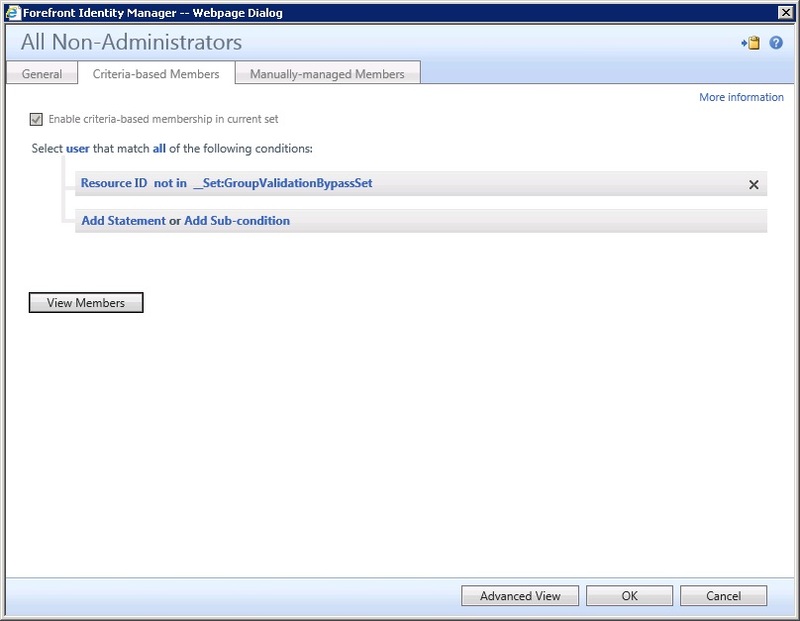 Then create the two MPR’s to allow the members of the administrative set to manage those groups – the first MPR allows modification (Read, Add and Remove) of the ExplicitMember attribute, while the second allows creation and deletion.